Finally, it seems fittingly ironic that a culture as youth-obsessed as ours faces a demographic future in which those over sixty-five will outnumber those under fourteen for the first time in our history. 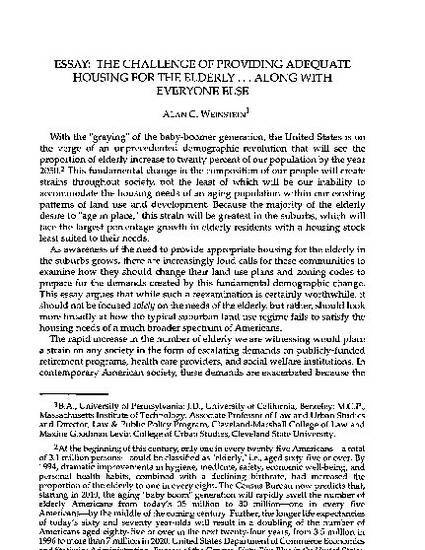 Irony aside, we are ill-prepared to deal with this new reality on several counts, not the least of which is the failure of our patterns of land use and development to accommodate the changed housing needs of an aging population. Primary among these needs is the stated desire of the elderly to be able to "age in place." To meet this need, America's suburban communities in particular will need to re-think their reliance on exclusive single-family zoning and begin planning and zoning for an increasingly large number of the elderly. Despite understandable concerns about maintaining housing values, this may well prove to be politically achievable simply because the very demographic changes that create the need will create a growing constituency in favor of the changes needed to meet that need. Moreover, by making our neighborhoods more friendly to the elderly, we will simultaneously make then friendlier to all other age groups as well.